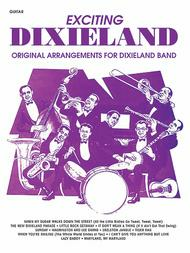 Original Arrangements for Dixieland Band (Guitar). Collections; Jazz Ensemble Collection; Performance Music Ensemble. Jazz. Book. 28 pages. Alfred Music #00-TBB0190. Published by Alfred Music (AP.TBB0190). May 29, 2008 Amateur Dixie Band is Really Pleased! Our players are at varying levels regarding their ability to read. They are mostly (except for me!) quite good at improvising, but we wanted to try and stretch a bit to perform some more intricate dixie arrangements. This book is excellent.